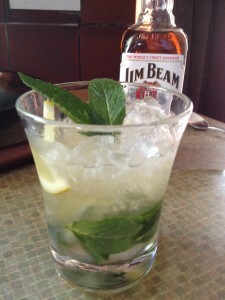 It’s-Too-Damn-Hot Lemon Mint Juleps – Hester cocktail hour! As part of the really terribly arduous research process for my new novel, which takes place in a hotel with a famous cocktail bar, I’ve set myself the challenge of making a cocktail every Friday afternoon at 4pm. And I’m tweeting the results, so you can cocktail-along-at-home if you want to… Look for the hashtag #hestercocktailhour. I’m around for the whole hour to chat about cocktails and other nice ways of passing an afternoon at the end of the week! Today’s cocktail was an It’s Too Damn Hot Lemon Mint Julep. So called, because it is very, very, very hot in Herefordshire at the moment. Too hot for anything but the absolute minimum activity. I have a garden full of mint (thanks, lovely green-fingered previous owner of this house, from the bottom of my Tom Collins glass) but I had no limes, and couldn’t quite summon up the energy to get in the car in this appalling heat to drive to the shops. I know. But there are limits. However, I did have a few lemons in the salad drawer of the fridge, and so with a bit of jiggling, I made this – and it’s a refreshing triumph! Dissolve the sugar in the lemon juice, then put the syrup into a cocktail shaker with the mint leaves and the ice and give it a good shake to bruise the mint so it releases its oil. If you can’t be bothered to go through your cupboards looking for the cocktail shaker, then just get a jamjar, or a big old coffee jar and use that. Don’t tell anyone, but it does the same thing. Then add the bourbon, shake again, and serve in a long glass with some lemon slices. Ah. Don’t you feel cooler already, just looking at that? !